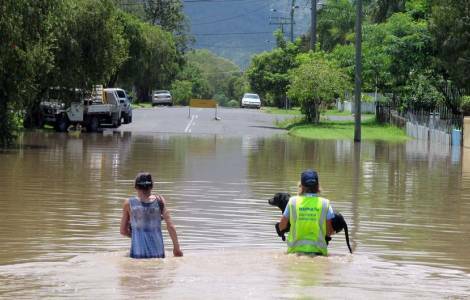 OCEANIA/AUSTRALIA - Flood in Townsville, the Bishop: "Do not give up: there is new life after death"
Flood in Townsville, the Bishop: "Do not give up: there is new life after death"
Townsville (Agenzia Fides) - "It is necessary to remember that we may have lost clothes and personal belongings, but we have our lives. When we can all return to our homes, we can put everything back in its place. It is time to reunite, as men and women of faith, in the awareness that the loss is only temporary and that there is new life after death". This is what was stated in a note sent to Agenzia Fides, by the Bishop of Townsville, Mgr. Timothy J. Harris, after the recent flood that brought the city of the Queensland region to its knees: the area was hit by heavy rains for 9 days, which resulted in two deaths, 650 displaced people, thousands of flooded homes and the invasion of crocodiles and snakes in urban streets. The same seat of the Bishop was also hit: "The water was near my house, so I accepted the advice to evacuate and move to a higher area. It is encouraging, however, to see the joint effort of solidarity: the streets are full of volunteers, emergency personnel, police and army offering assistance in the evacuation phase and supplying sandbags: everyone is here to help others and in moments like this, one sees people's true hearts". The note states that, according to the Catholic Education Executive Director, Jacqui Francis, most of the Catholic schools in the Townsville area have not suffered particularly serious damage, except for "St. Margaret Mary's College", located in an area particularly affected by the flood.